Vineyards were originally planted on our Home Ranch property in 1889. When Mike and Lucille Teldeschi bought the property in 1947, there were some established vines, including our Old Vine Zinfandel vineyard. 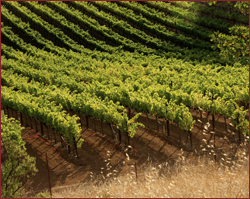 Our Home Ranch totals 50 acres, with 26 acres planted to grapes. The property is on the Dry Creek Valley benchland, meaning it is elevated above the valley floor, with an undulating terrain. This slight elevation and soil that differs from the valley floor provides enough of a contrast that you can taste it in the wines produced from our vineyards. 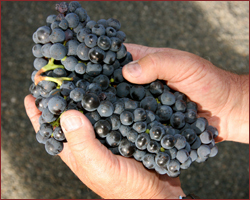 In 1969, Joseph Swan purchased Zinfandel grapes from Mike Teldeschi. When the wine made from those grapes was released a few years later the wine media couldn't say enough great things about it, and wineries lined up for Teldeschi grapes. 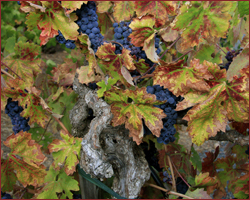 This precedent continues to this day with some of the top wine producers in Sonoma County buying Teldeschi Vineyards – Home Ranch grapes year after year. What makes our grapes so sought after? Ray says it best, "I treat the vineyard the same way I treat my body. I don't take medicine unless I really need it, and I try to eat healthy foods. "I don't use anything in my vineyard that will harm the plants or the grapes. If the grapes need something, I find the safest way of getting them what they need. This is what my dad did when he brought the land in the 40s. He taught me to love and respect the land, and treat it accordingly." 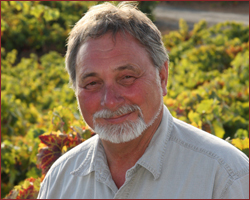 Ray's knowledge of vineyards is well known, with one of his winery neighbors referring to him as the Grape Buddha. Ray knows each grape variety is slightly different and has different needs. Meeting these needs translates into extensive hand labor in the vineyards. During each growing season, every vine is touched multiple times to ensure the healthiest of vines produce the best possible grapes. But, the proof is in the glass. We invite you to try a Del Carlo wine and taste the difference.